Synthetic resin based final varnish. Completely colorless and rapid drying. Harnful if swallowed, in contact with skin or if inhaled. May be fatal if swallowed and enters airways. May causa an allergic skin reaction. 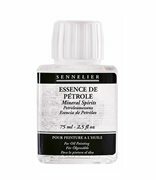 Mineral spirits have an advantage over vegetable spirits that it keeps better on contact with air. Harnfull: May causenlung damage if swallowed. Repeated exposure may cause skin dryness or cracking. Keep out of the reach of children. Permite fluidificar la pintura conservando su aspecto inicial. Aceite purificado, un poco ambarino naturalmente, extraído de las semillas de lino. It extends the work by increasing the drying time and facilitating mixture of paints and media. Barniz en aerosol, disponible en tres acabado (brillante, satinado y mate) para proteger la pintura con una película transparente, que no amarillea, tensa y duradera. Aerosol extremadamente inflamable. Recipiente a presión: Puede reventar si se calienta. Provoca irritación ocular grave. Puede provocar somnolencia o vértigo. Nocivo para los organismos acuáticos, con efectos nocivos duraderos. Clear non-yellowing synthetic resin and alcohol. 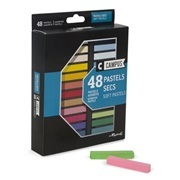 For pencil and charcoal. Extremely flammable aerosol. Pressurised container: may burst if heated. Causes serious eye irritation. Dammar gum based light varnish, fast drying. To correct sinkage, brighten the tones or restart oil work on a dry base. Extremely flamable aerosol. Pressurised container: May burst if heated. Causes skin irritation. May cause an allergic skin reaction. Causes serious eye irritation. May cause drowsiness or dizziness. Toxic to aquatic life with long lasting effects. Pasteles suaves en barras cuadradas de colores brillantes e intensos. Surtidos de 12, 24 y 48 colores diferentes. ArteDeco is a high quality fluid acrylic manufactured with the best artists pigments and resin in a special formula of medium viscosity and superior coverage. Bottle 60ml. Textile color is a range of brilliant, permanent waterbased colors, manufactured with a special resin which keeps the fabric soft to the touch. Click on the image to see color chart. Brilliant and permanent waterbased colors for silk painting, easy to use, iron-fixable. Click on the image to see color chart. 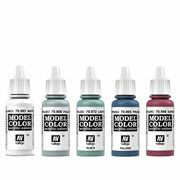 A range of 223 acrylic colours, very highly pigmented, formulated for models and miniatures. Model Color is indicated for all surfaces, and especially formulated to adhere to plastics and polyesters. PREMIUM RC is a safe wáter-based, non toxic and highly versatile airbrush ready paint, suitable for all surfaces, but especially formulated for superior adhesión to metals, fibreglass, polyethylene, clear Lexan polycarbonate, slot car and RC bodies, and all tunning and automovile applications.